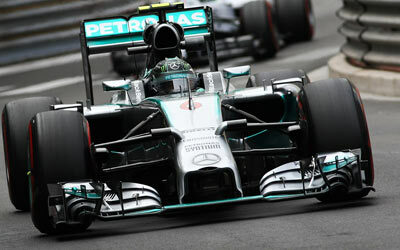 Nico Rosberg put his Mercedes in pole position for the Monaco Grand Prix, despite an error on his final flying lap. Lewis Hamilton was second fastest and completes yet another front row lockout for Mercedes AMG. With just a very tiny probability of more rain this weekend, the start of qualifying is again very sunny, helping drivers to get their tyres up to temperature. Rosberg, Hamilton and Vergne are the first to take the track, but at a tiny circuit as Monaco where traffic usually plays a crucial role, many others soon follow suit. Most cars remain on track for several laps, opting to run with the soft tyre. Mercedes, Ferrari and Red Bull opt for this strategy. Kvyat meanwhile struggles to keep his car under control under braking out of the tunnel and eventually touches the barrier with his front wing. He impact clips the wing off and forces the Russian to go straight on. The incident was spectacular but did little damage to the car. He managed to get his car back and back on track and return to the pits. As drivers started to change to the supersoft halfway into the session, Rosberg and Hamilton continued on the soft. Their times remained competitive throughout the session, with Rosberg ending up 2nd fastest, ahead of Hamilton 3rd. Fastest in Q1 became Jean-Eric Vergne who managed a traffic free lap one minute before the end of the session. At the very end of the session, Markus Ericsson managed to get into the spotlight by locking the rear wheels under braking. Despite an attempt to avoid a collision, he ended up onto the front wheel of Felipe Massa's on the exit of Mirabeau. That made sure Ericsson could not improve and will have to start from the back of the grid. Felipe Massa was already through to Q2, but despite making it to the pits, suspension damage prevented him from taking part in Q2. Rosberg and Hamilton was again early to join the party in Q2, queuing at the end of the pitlane to get started, this time immediately on the super softs. Unsurprisingly, both soon were sufficiently fast to ensure a place in Q3. A bit later, Ricciardo and Vettel positioned themselves in third and fourth, ahead of Alonso and Raikkonen. Still, in the closing stages, even the front runners returned to the track with Hamilton edging out Rosberg this time. Vettel improved to third, ahead of Alonso, Ricciardo and Raikkonen. Both Toro Rosso drivers in the end only just managed to get through to Q3 while the Lotus cars, along with Hulkenberg, Button and Bottas. Massa obviously will start from 16th after not setting a time in Q2. In Q3, Perez was the first man out, soon followed by the Ferraris and Sebastian Vettel. 6 minutes later and halfway into the session, Nico Rosberg topped the times, ahead of Hamilton, Ricciardo, Vettel, Alonso and Raikkonen. Vergne 7th, Magnussen 8th, Perez 9th and Kvyat 10th. Soon after, everybody entered the pits to take on a new set of supersofts for the final three to four minutes. Raikkonen was the first to set a time in the end, improving, but not enough to improve Alonso's lap. Ricciardo also didn't manage to improve while Rosberg missed his braking points at Mirabeau, waiting in the run-off area until everybody passed. The resulting yellow flags however prevented everybody else to push through, making it an easy pole for Nico Rosberg.